Sorry - I've had a lot going on this week, including me being a wretched, mostly ill ball of stress. I should be back with some interesting news early next week. 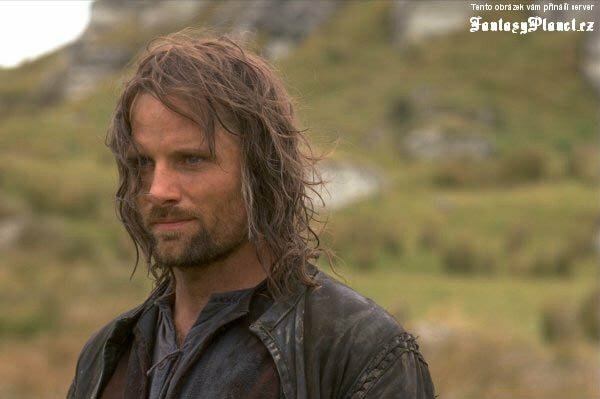 Oh, and ladies - is it just me, or is Viggo Mortensen much hotter with the long straggly hair, beard, and cinematic filth of Middle Earth? Hell, maybe it is just me. Generally, I'm not into guys with visible dirt layers and hair that screams "Led Zeppelin Roadie", but in Middle Earth, it's quite nice. In a completely unrelated note here at Non Sequitor Blog Theater, Marvel Comics announced today that Stephen King will be telling more tales of Roland Deschain, the Gunslinger, in comic form, starting next April. I swear to god, hearing this was like winning the lottery. Last night, the Sasquatch told me this (news had leaked prior to the official announcement) and, once I determined that my bigfoot bubba buddy wasn't pulling my leg, I had the biggest grin on my face. Antihero, schmantihero - Roland Deschain rocks my world. If you read my blog early on, you know that I took a very emotional journey reading all 36 bazillion pages of the Dark Tower books over, basically, a two-week period this spring. 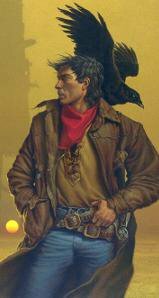 I was totally wiped out when I finished the last book (which had me blubbering like a idiot at least four times), and I still find that the Gunslinger haunts the back of my mind. Damn you, Stephen King! What is it with "guy" things making me lose it? The Lord of the Rings? The Dark Tower? Apparently, I flunked out of Girly Girl 101 a long time ago. By the way, I just found this weirdass nightmare thing via Google Images. WTF, man? WTF? I recently saw Viggo in The History of Violence, and he's a hottie in a clean-cut kind of way, too. He's just...got it. I saw History of Violence at a freebie preview. Good movie. Weird audience. I love Viggo best in Middle Earth. Integrity, strength, quiet but commanding... very hot. And my sympathies for stress... I was sleepless last night too. Probably would've been better off putting in my ROTK dvd, but I just stayed in bed trying to calm my mind and sleep. (end result- I'm totally wiped out today) argh. Five words: "A Walk On The Moon." And no, it's not just you. He is hotter with dirt. It's not just you, Viggo is good stringy haired and dirty... one of life's unanswerable mysteries, don't try to fight it, just embrace it. I haven't watched "A Walk On The Moon" - Ummm... will it make me cry? LOL! Wishing you some sleep and pleasant dreams of Middle Earth. he is totally hotter with the scruff and the dirt. totally.